The Department of Hospitality Management would like to invite you to attend the 22nd annual Travel and Dining Auction. 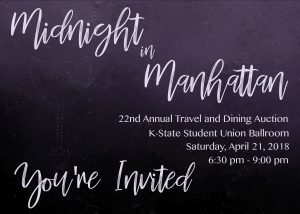 The auction will take place on Saturday, April 21 from 6:30 to 9:00 p.m. in the K-State Student Union Ballroom. Tickets are $30 in advance and $45 at the door. Tickets can be purchased here. This year’s auction will feature over 150 auction packages that will be featured in the silent or live auction portion of the evening. The night will provide a Paris theme, with a French themed menu and décor. Prior to the event, all of the auction items will be available for bidding online. This is a great way for those unable to attend to support the auction. The items will be available starting April 7 and bidding will conclude April 19. For more information and a link to the online bidding, visit www.k-statetda.com. The Travel and Dining Auction is the largest student fundraiser in the College of Human Ecology that is planned and executed by students. Proceeds from the auction are used to fund student scholarships and support all Department of Hospitality Management student organizations including: Club Managers Association of America, Hospitality Management Graduate Club, Hospitality Management Society and Professional Event Management Society. For more information on the auction and to keep up with the students’ progress, please visit their website, www.k-statetda.com. This article was posted on Thursday, April 5, 2018, and is filed under College News, Hospitality Management.